Today begins a series of tutorials on constructing a Federal Enlisted Frock Coat, as was used during the American Civil War. I’ve made about a dozen of these coats in the past year, with more under way as you read this. 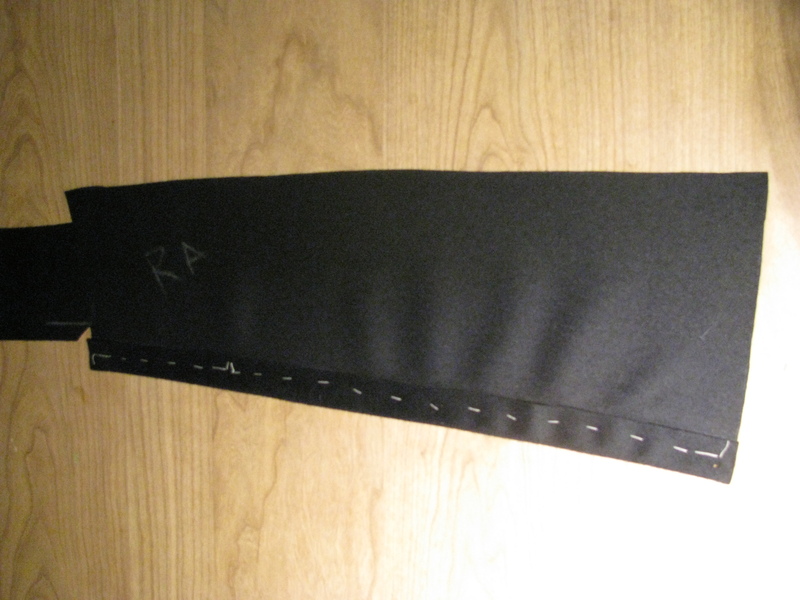 In this post, we will mainly discuss the tail facings, preceded by some cutting photos. While I’m working specifically on a military styled coat, these techniques will be useful for many other types of period coats. Here are a few photos of the frock pieces drawn out on the fabric. 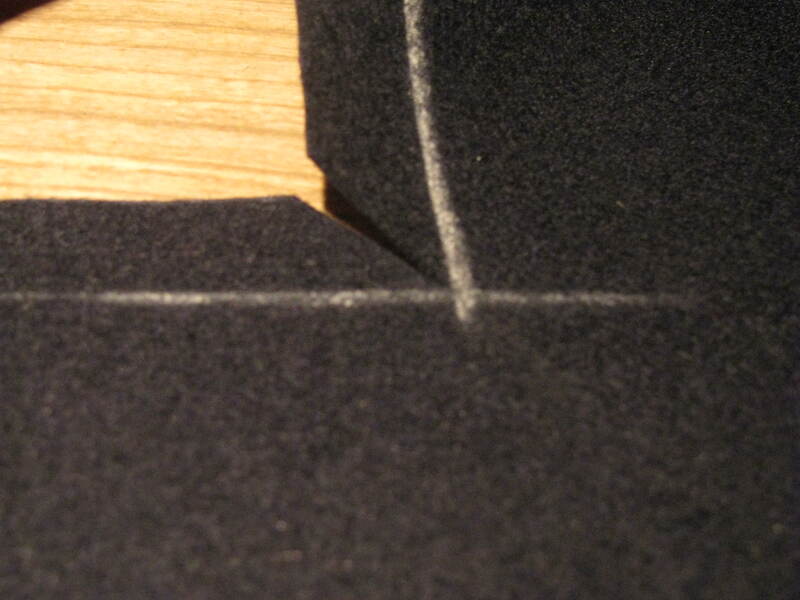 I’m using Hainsworth‘s superfine wool broadcloth, in navy blue. 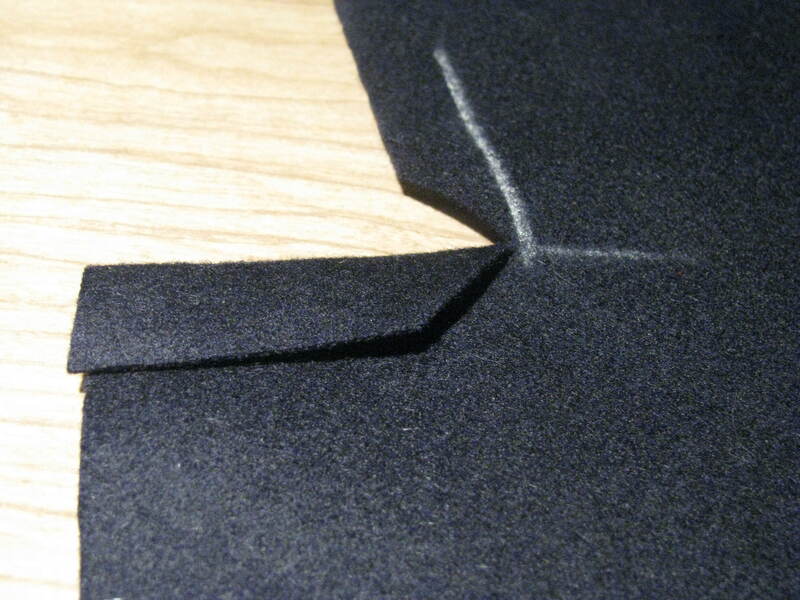 This fabric has a very pronounced nap, where the fibers are raised and brushed in the same direction. 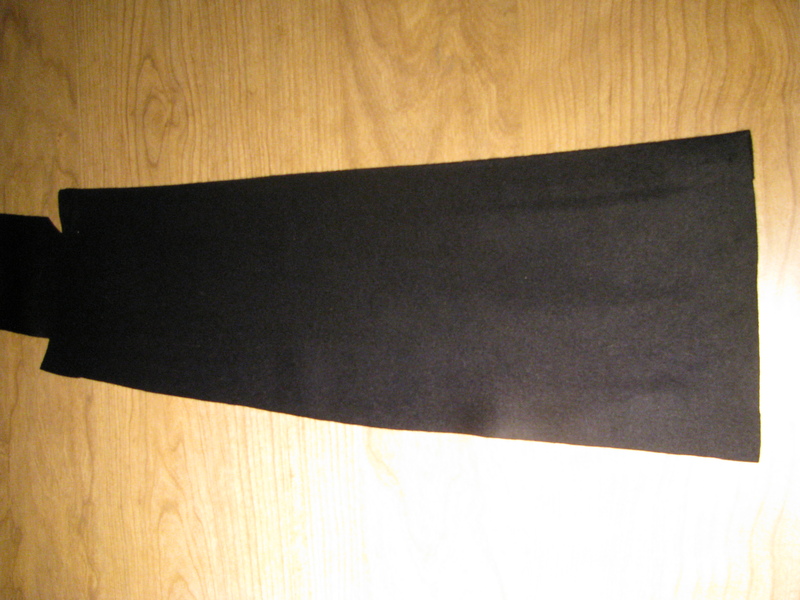 The nap gives the fabric an almost shiny look to it, and besides looking really nice, aids in repelling water and dirt. Because of the nap, however, care must be taken to lay out all of the pieces in the same direction. 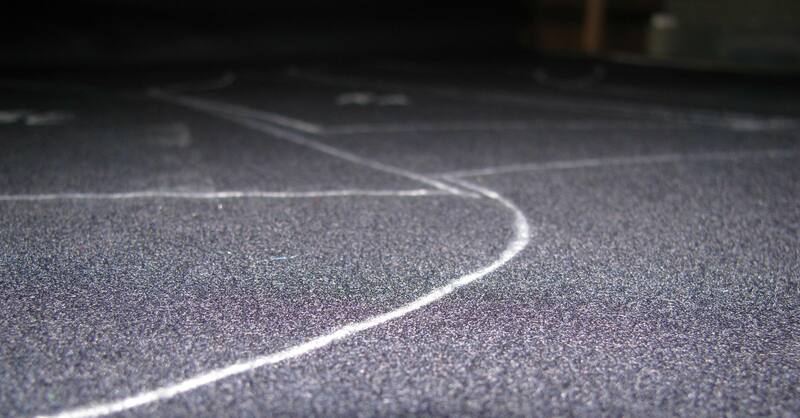 Next we have a close up of a chalk line on the fabric. Nothing really useful about it, I just thought it was a neat picture. One thing to note is to always cut on the inside of the chalk line. 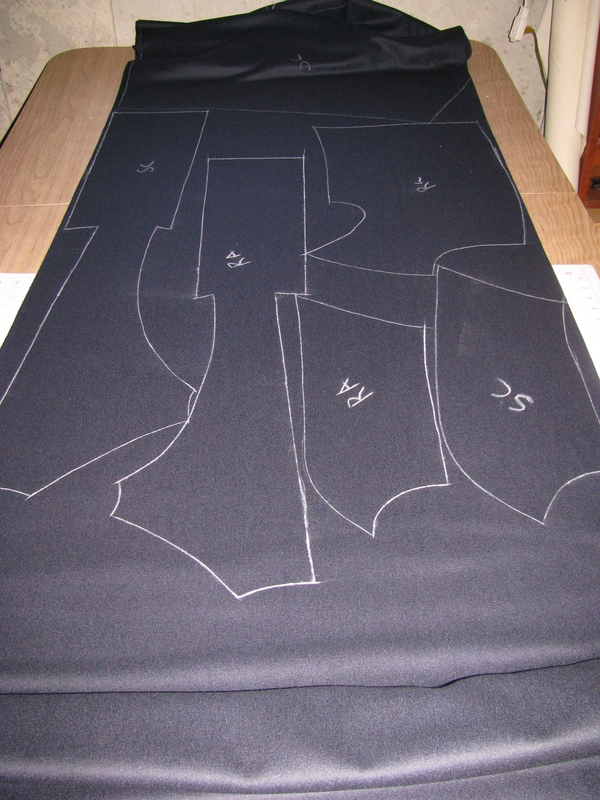 The chalk line is about an eighth of an inch in width, so cutting on the outside would add too much fabric, affecting the fitting of the coat. 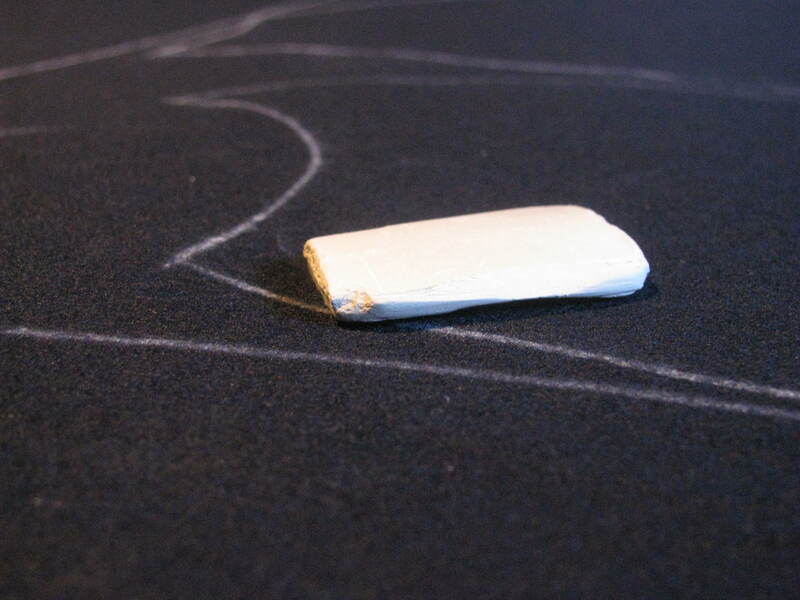 I use a tailor’s chalk available from B. Black & Sons called “Jem’s” Tailor’s Chalk”. As long as you keep it sharp, unlike in this next photo, it is great for drawing lines, and comes right out with a little brushing. Here’s one last shot of the pieces laid out. Try to minimize the waisted fabric, and get the pieces as close together as possible. Finally, here are all the pieces cut out. 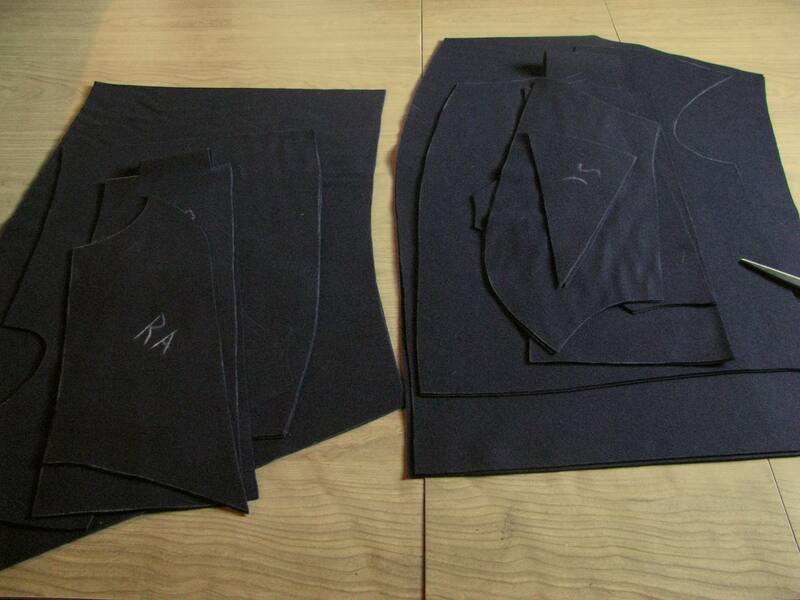 You’ve actually been seeing two coats laid out on the fabric. Took about three yards of fabric total. I’m keeping a very accurate record of the time I spend on each step. From laying out all the pieces, chalking around them, and cutting everything out, the total time was 55 minutes. 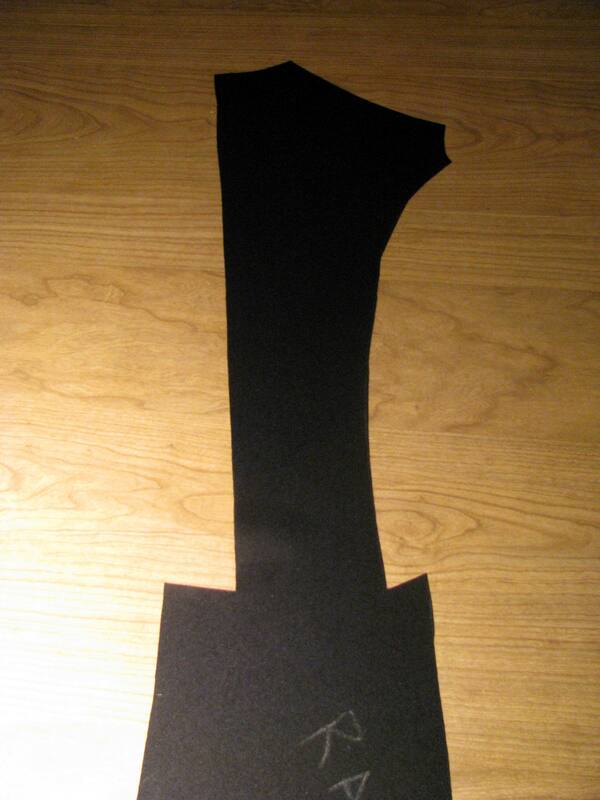 The first step in actually constructing one of these coats is to make the tail facing. 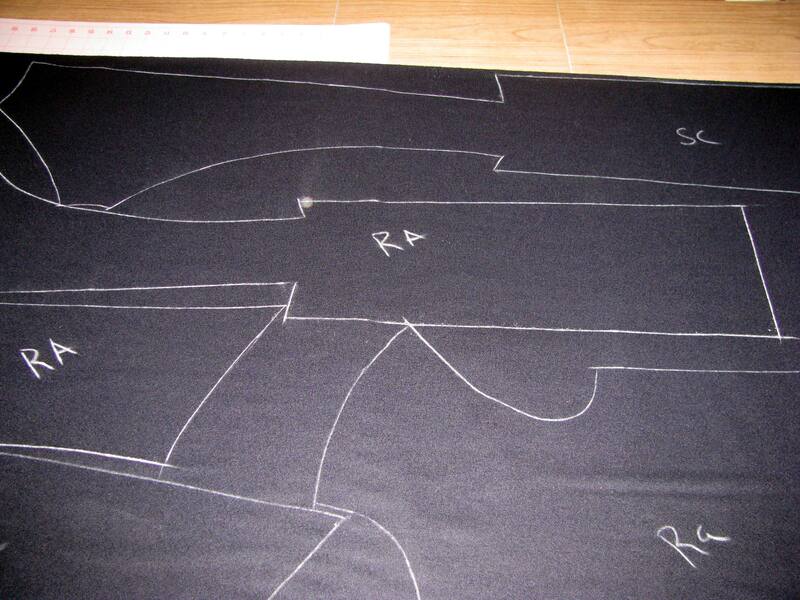 We’ll be working with the two back pieces of the coat for this step, as illustrated in the photo. 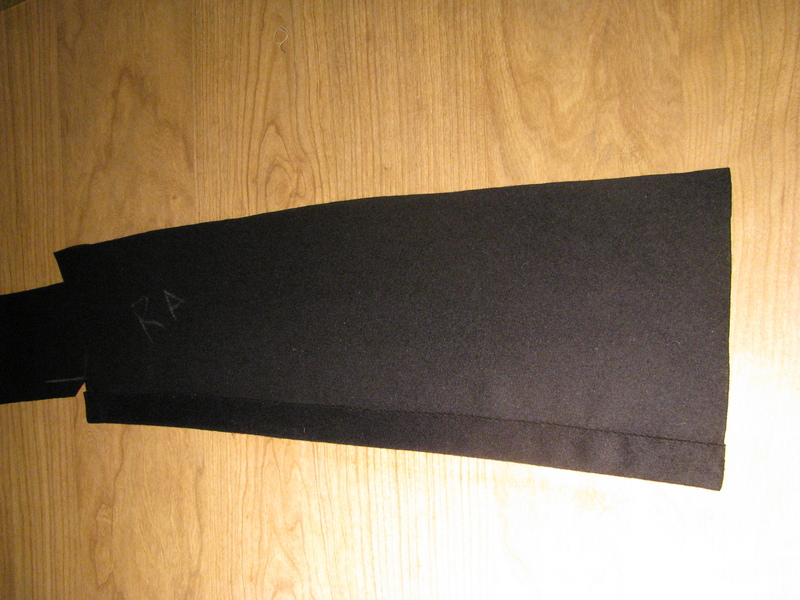 Chalk out the seam lines near the center back pleat. In my case, I’m using .5 inch seam allowances. 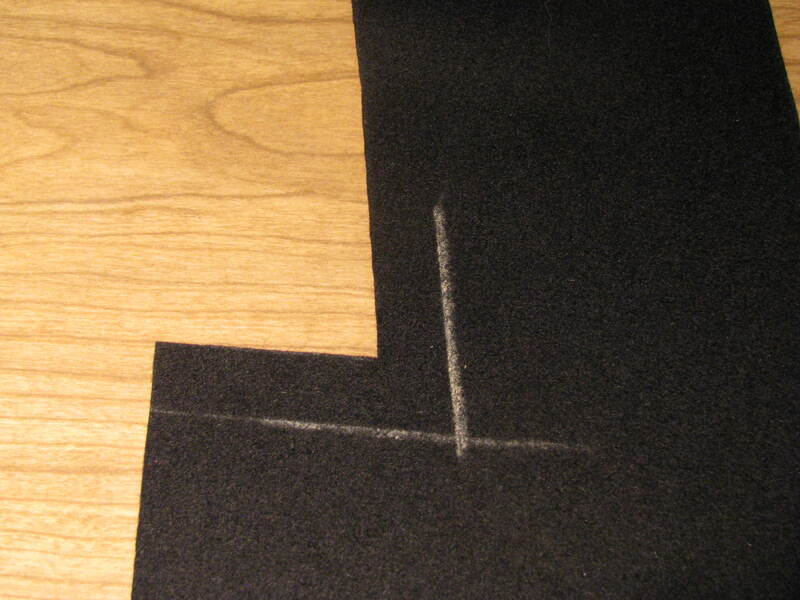 Cut on a diagonal from the corner, to the intersection of the two chalk lines. Be careful not to actually cut the line, remembering that the chalk line has it’s own width to it. 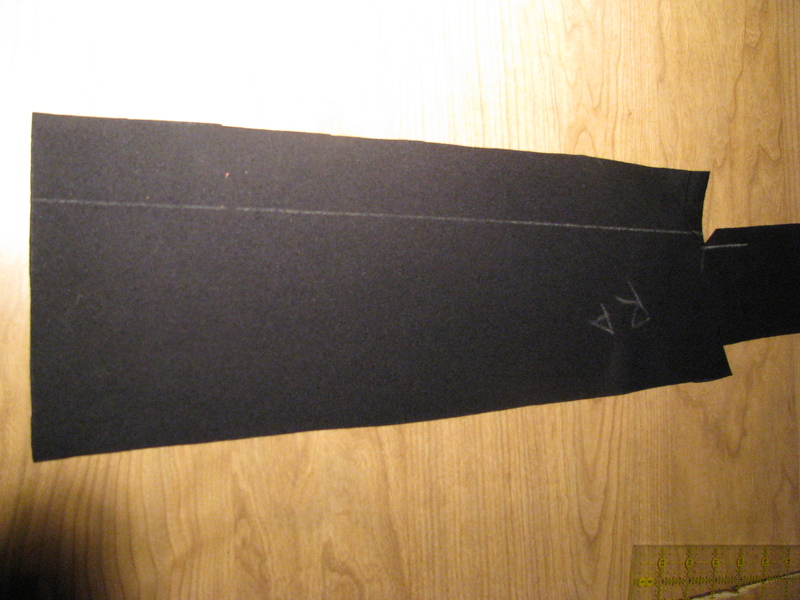 Now fold the seam allowance down towards the tail, and press. If necessary, you may baste this before pressing. Next, whip stitch the seam allowance to the tail, being very careful not to let the stitches show through to the right side. Now on to the actual facing. Determine how wide you want the facing to be. I prefer 7/8″, as it gives enough weight to the facing to keep the tail from blowing around too wildly, while not being too bulky. After you have determined the width you want, double that, and draw a chalk line along the edge at that width. That would be 1 3/4″ in my case. Here’s what it should look like from the right side of the fabric. 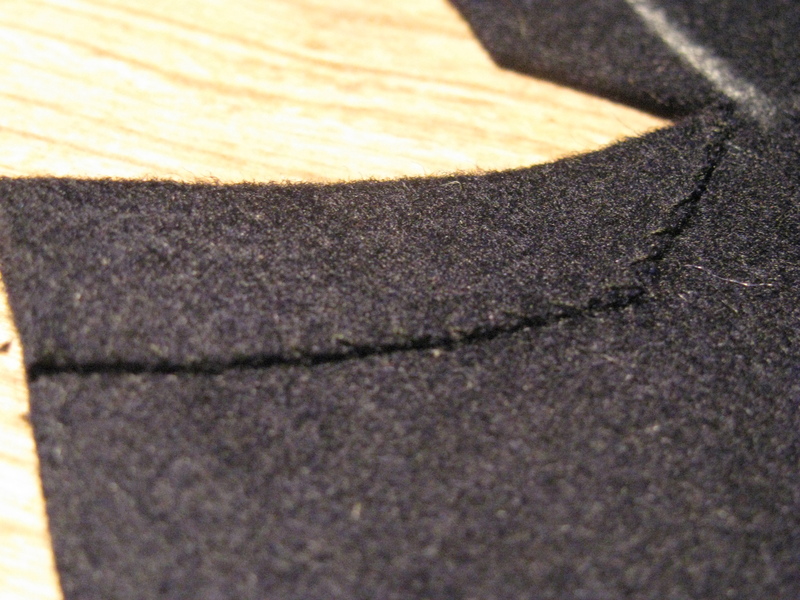 No stitches showing through, nicely pressed, and sharp looking edges. Here’s one last photo showing the actual stitches. Another cool close up. Strive to make your stitches perfectly even, and small. Also, do not pull too tight, or the fabric will pucker, and make sure it doesn’t show through to the right side. Total time for this step is an average of 45 minutes. Next time, we’ll discuss assembling the body of the coat. very cool. i didnt realize how complicated these coats were to make. Do you have a pattern for this? Yes, if you go to http://williamsclothiers.net and sign up for a free account you can access the pattern draft for a frock coat. The rest of the instructions are included in the payed members area. I’d like to sign up and make one of these!! Currently shopping for fabric and wondering what weight and color of wool broadcloth? Navy? Indigo blue? Wt? Thanks! Sounds good! Registration is opening in a couple of weeks. 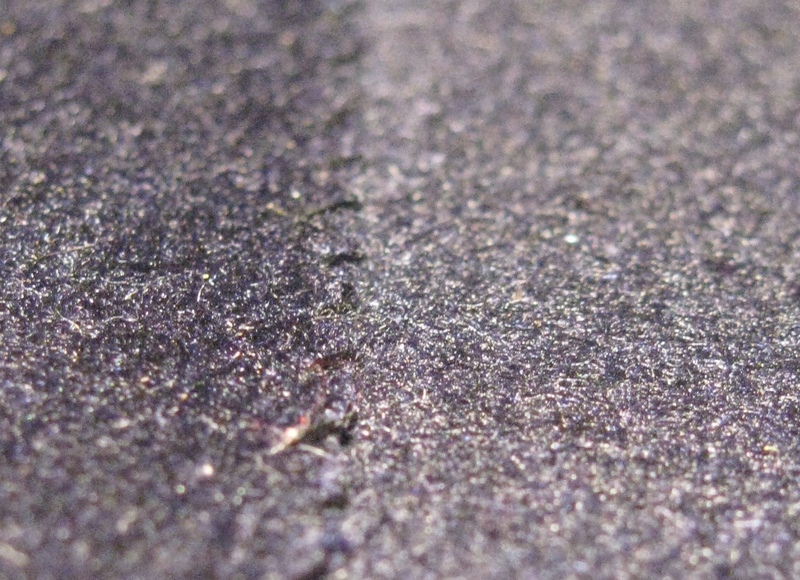 For fabric, I usually use Hainsworth doeskin found here, in navy blue. https://www.hainsworth.co.uk/collections/doeskin/ It’s a little lighter than the originals, which I believe were 19oz, but still produces a beautiful coat. Worth the expense.